What are the three most important items you carry on a daily basis? For many, the top two are probably a wallet and phone. One can’t get much done without those two nowadays. What would you say is the third on your EDC hierarchy? Keys? Flashlight? Knife? For a great number of people, the knife is not only essential to a successful EDC setup, for them, it’s the single most important item they carry. As simple as a knife may seem, this age-old tool has been indispensable to mankind since prehistoric times and still serves a great multitude of purposes for us today. It can be used many times a day from something as innocuous as opening a package or slicing an apple to something much more dramatic such as breaking glass to rescue someone stuck in a crashed vehicle or even as a defensive weapon if one is attacked. With so many knives on the market, where does one start their search for the perfect every day carry knife? 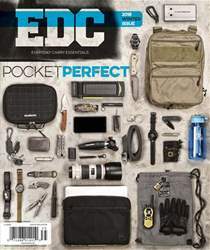 Like many other EDC items, you’ll want to look for a good mix between practical usage, size and budget. What does your average day look like? Are you a professional who is in an office most of the day or do you jump out of planes for a living? How do you carry your EDC? Are you limited to just what’s on your person or do you have a bag with you all day long? How much are you willing to spend on a blade? For what tasks would you use the knife? Answering these questions should give you a better idea of what kind of knife you should be looking for. There are other factors that one should take into account, such as the way a knife looks and feels in the hand. The look and e specially feel of a knife are important when choosing a knife. The feel is important for obvious reasons, it should be balanced and controllable, and also easy to deploy and close its blade if you’re looking at a folding or automatic knife. It should be pleasing to the eye and fit your sense of style, as well, since you’ll be carrying it da y in, day out.